Arrives in a protective box with a Certificate of Authenticity. Limited mintage of only 1,000 statues! Contains 8 Troy oz of actual silver content in Antique finish. Coco the Dragon comes to life with wings outstretched. Dragons may be mythological creatures from ancient times, but they fascinate children and adults alike. While there are real-world dragons on planet Earth, such as the Komodo Dragon, they pale in comparison to the tales of ancient dragons. These 8 oz Antique Finish Coco the Dragon Silver Statues feature the imposing image of a Coco, with her wings outstretched as she sits perched at the edge of a rocky crag. Her mouth is agape and her legs indicate she is ready to leap from the rock cliff and take flight, or pounce on prey, at any moment. Details on this Coco the Dragon Silver Statue are incredible, ranging from the pointed horns on her head and razor-sharp talons to the precise details of the scales covering her body. Coco stands more than 8 cm in height, and has a wingspan of 11 cm. 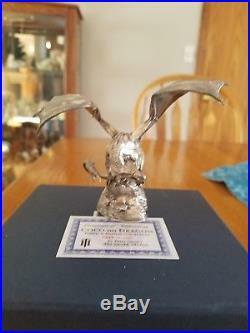 Each 8 oz Antique Finish Coco the Dragon Silver Statue was designed and imagined by Jesse Sandifer. Sandifer is a 3D digital master sculptor, and developed this first statue in the Dragon Collection exclusively for Heads or Tales Coin Company. Additionally, these 8 oz Coco the Dragon Silver Statues have a proprietary antique silver finish applied. Antique finishes typically add warmth and depth to any design, while also providing the appearance of age on products which are brand new. Coco is the first in a Dragon Collection, with Heads or Tales planning a statue of her twin sister that will contain 1 Kilo of solid silver and boast a size that is 50% larger than Coco. 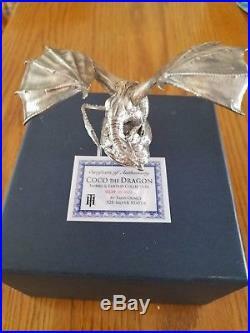 The item "JM Bullion 8 oz Antique Finish Coco the Dragon Silver Statue (Box + CoA)" is in sale since Monday, January 29, 2018. This item is in the category "Coins & Paper Money\Bullion\Silver\Coins". The seller is "diggersbc" and is located in Longmont, Colorado.